PLOT: Ilya and Alexander Salkind continue to bring the lore and legend behind the World's Greatest Super Hero to the big screen in this follow-up to the beloved Christopher Reeve Superman films. 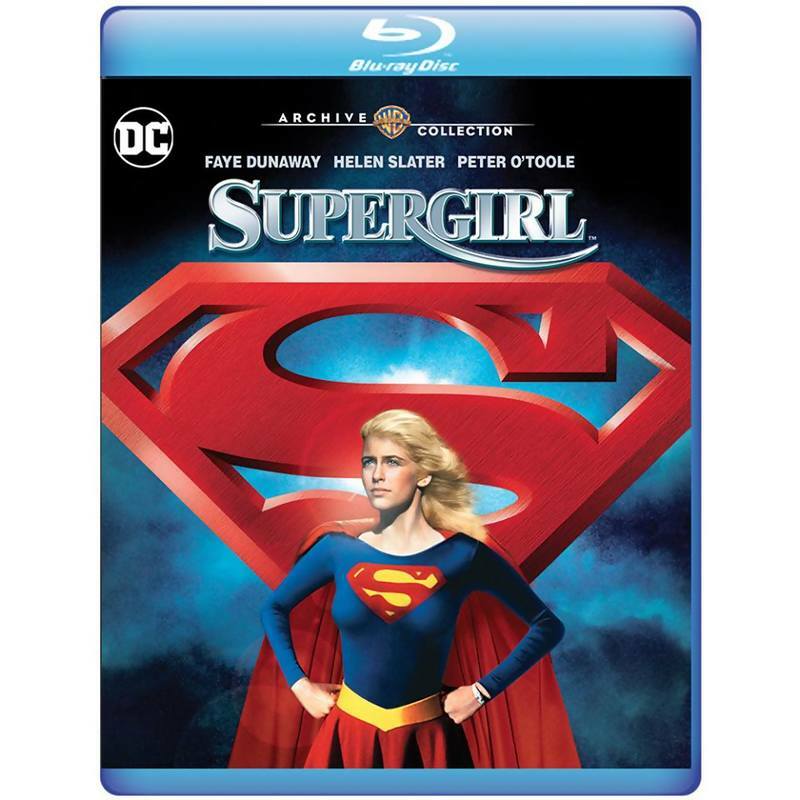 Helen Slater (in her screen debut) stars as the sensational Supergirl! Though Superman grew up believing himself to be the Last Son of Krypton, part of his home planet survived: Argo City, home of his uncle, Zor-El (Simon Ward), and Zor-El's wife, Alura (Mia Farrow). Saved by the wizardry of Zaltar (Peter O'Toole) and the Omegahedron, their daughter Kara comes of age as a Kryptonian when a disaster whisks the Omegahedron to her cousin's adoptive planet, Earth. 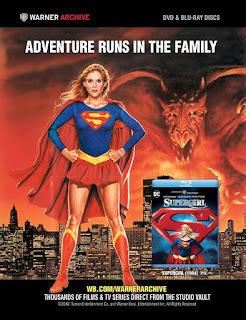 Dispatched to rescue it from the clutches of the evil sorceress Selena (Faye Dunaway), Kara must tackle a steep learning curve so that she can pass the test as both mild-mannered schoolgirl Linda Lee and Supergirl!This special edition of Supergirl presents the film's International Cut, remastered in High Definition for Blu-ray, along with the rare Director's Cut on a bonus DVD. From the beginning of production, Supergirl seemed a bit on the snake bit side. By the time production began and the movie premiered, the gas in the Superman franchise tank started to dry up and interest in future franchises started to dwindle. Batman, of course, was a few years away, so major superhero movies (and most importantly, the profits that came with it) weren't exactly a priority in Hollywood. But, sure enough, for better or worse, Supergirl was given to the world. For all the crap this movie has been given through the years, I have to assume it's due to the silly story and plot, there's still a lot of positives. First thing's first: Helen Slater, in her first feature film role, makes a perfect Supergirl. While others including Brooke Shields and Demi Moore were considered for the role, Helen embodied the Maid of Might and embraced it. Her innocence and naivete toward a new world while learning about her powers and legacy was quite a nice side story and became beloved. Faye Dunaway, who accepted the part of Selena, after Dolly Parton allegedly turned it down, was sadly not as well received but still acknowledged how much fun she had in the role. Dunaway brought much needed experience to the movie with her acting experience. Hammy and campy in nature, Faye certainly delivers a memorable performance, no doubt inspired by comic book villains of the 1960s and 1970s loved the role so much she even hosted a making of documentary(included as a bonus on this disc). Kara's new friend of Lucy Lane, is also a memorable highlight as she provides some much needed comedy to the movie as well, despite her foul mouth at times. But hey, everyone has that trouble making friend! The music for the movie is also a bright spot. Jerry Goldsmith, veteran film score composer, brought the right mood and a great soundtrack. Especially for the movies memorable "flying ballet" scene where Kara discovers her powers for the first time, twas included in the International cut which also happens to be one of the movies best scenes. As far as the negatives, the storyline is super hokey and campy and the fact that a side story of Selena and Supergirl essentially fighting over a guy, is a little hard to watch. The fact that Christopher Reeve never appeared as Kara's famous cousin, somewhat hurt the movie too. Although one could argue that appearing as Superman could have potentially distracted audiences from trying to establish a new, fresh hero. Maybe if we had gotten a sequel or two, he could have appeared, but that's all hindsight and just my opinion. 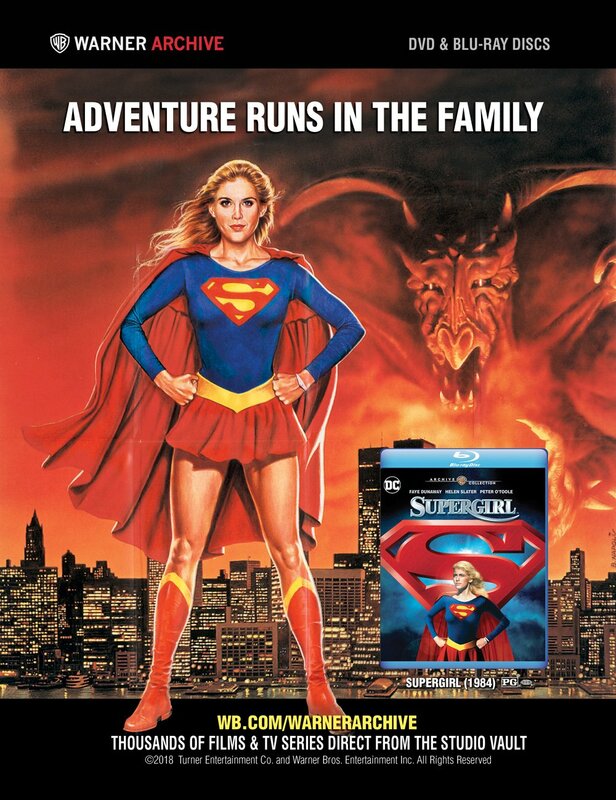 For the first time in years, the International Cut and Directors Cut of Supergirl are available. While my preference is the International Cut it's great to have both options. Originally offered in a limited edition Anchor Bay dvd, fans of Supergirl and superheroes in general can finally complete their bluray collection. As someone who had a burned copy of the AB release for years, I'm happy to see these two in the same package once again with a better transfer. The transfer was very well done by the folks at Warner Archive, as it's presented with such clarity and brightness, it enhances the experience. Also included were the 1984 Making Of special, commentary ported over from the AB release and of course a trailer. This is a very visual movie so an upgraded transfer was a welcome change for those of us who have grown up and adored it. It's sure to please old and new fans! You can purchase your copy of Supergirl here!